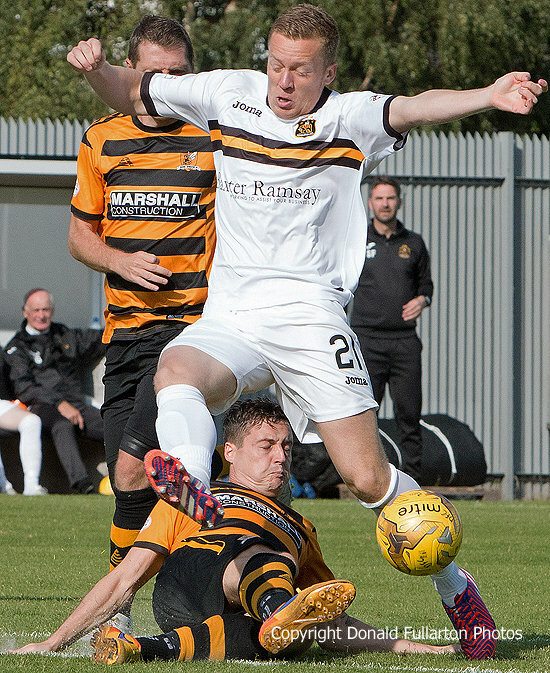 DUMBARTON slumped to a 2-0 home defeat at the hands of Alloa Athletic — their first win of the season. DUMBARTON slumped to a 2-0 home defeat at the hands of Alloa Athletic — their first win of the season — in front of a meagre 715 crowd. The home side passed up chance after chance during a mediocre first half, and they were to pay the price later. The visitors grew in confidence, and were rewarded midway through the second half when a quick free kick led to a Graeme Holmes goal. Sons threw everything forward, but were incapable of scoring. Chances went abegging, and a bad day at the office almost ended when Grant Gallagher headed over the bar from two foot out. There was worse to come, however, when the Wasps killed the game in injury time with Eddie Ferns grabbing a second killer goal on the break. Scott Brown is pictured hurdling a tackle.